Transition Form or TRAN-1 is filed by those taxpayers who are eligible to claim the credit on the tax already paid in the pre-GST regime. The credit can be by the way of VAT/Service Tax/Excise Duty. In order to claim the complete amount as a credit, TRAN-1 is to be filed along with the particulars of stock carried forward. Who can file GST TRAN-1? All the persons registered under the Goods and Services Tax (GST) who may or may not be registered under the pre-GST regime. 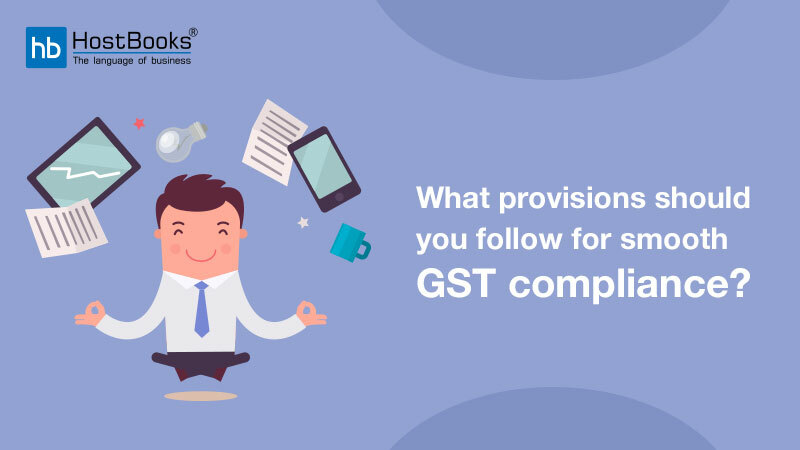 It involves all those who migrated to GST and have an ITC on closing stock.However, the composition dealers under GST need not file Transition Form 1. What are the steps to file TRAN-1 under GST? Click on “Services”, then click on “Returns” and finally on “Transition Forms”. All the tiles relating to TRAN-1 will now be displayed on the screen. Next, select “Yes” or “No” based on whether a return has been filed in the last 6 months. If you have already submitted TRAN-1, then the same can be modified through the Reopen button. But, it should be noted that the data can be modified only once. Under this section, the ITC to be carried forward from old tax regime to GST regime is included. All the fields are to be filled in and the details need to be saved. In case any error, the same will be reflected right away and has to be rectified. This section contains the particulars of ITC not availed and is to be carried forward. The details for each invoice are to be entered separately. You also have an option to upload JSON file in case there are many entries. Inputs held in stock as on July 01, 2017. Inputs in semi-finished goods or finished goods held in stock as on July 01, 2017. Under this, the ITC summary is to be transferred as CGST credit to your existing GSTIN. The PAN in both the cases i.e. old tax regime and GST regime should be the same. The amount mentioned will be added up to the electronic credit ledger. This section requires you to provide details of goods sent to job-worker and held in stock by him on behalf of the principal by the principal and agent. After entering data in each tab, you need to click on “Save”. 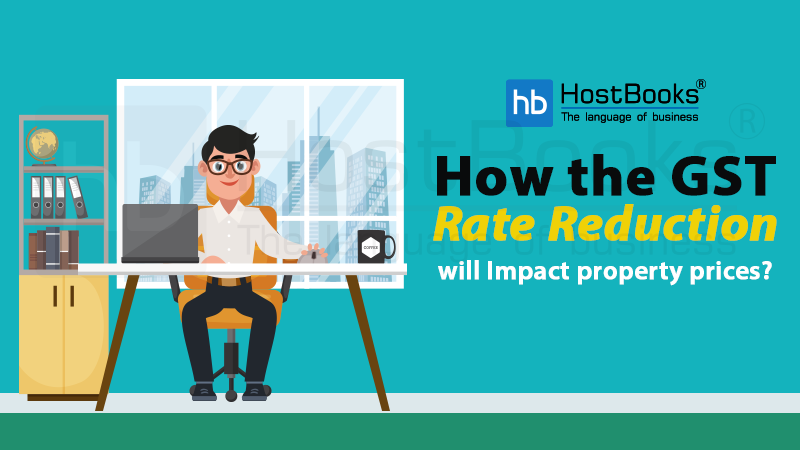 The errors in the data will be highlighted and need to be corrected accordingly. Under this section the details of goods held in stock as agent on behalf of the principal u/s 142(14) of SGST Act and the admissible credit to the agents on such stock. This section requires the details of tax paid under pre-GST regime to be furnished along with the credit allowed under GST on the supplies which were earlier taxable under VAT and Service Tax regime as well as GST regime. 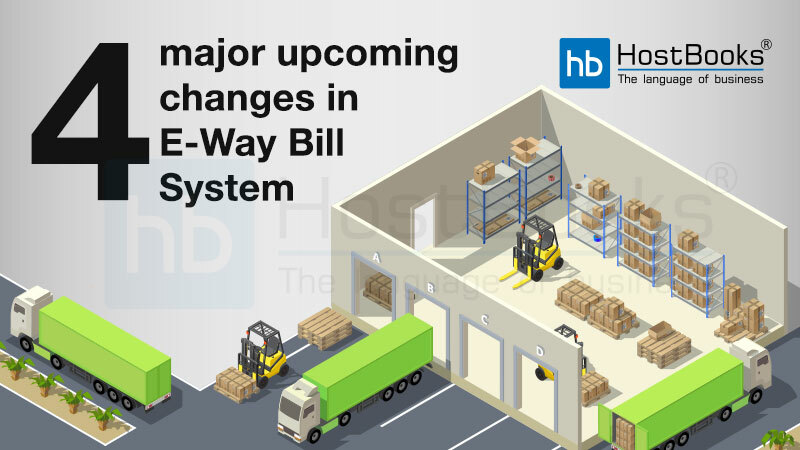 Under this section a summary of details of goods sent on approval basis after January 01, 2017 but returned after July 01, 2017 is provided. Next step is to click on “Submit” in order to freeze the details. The details once frozen cannot be modified. In this step, a warning message will be displayed on the screen (as shown below). Click on “Proceed”. As soon as you click on Proceed, the status of TRAN-1 will be changed from “Not Filed” to “Submitted”. 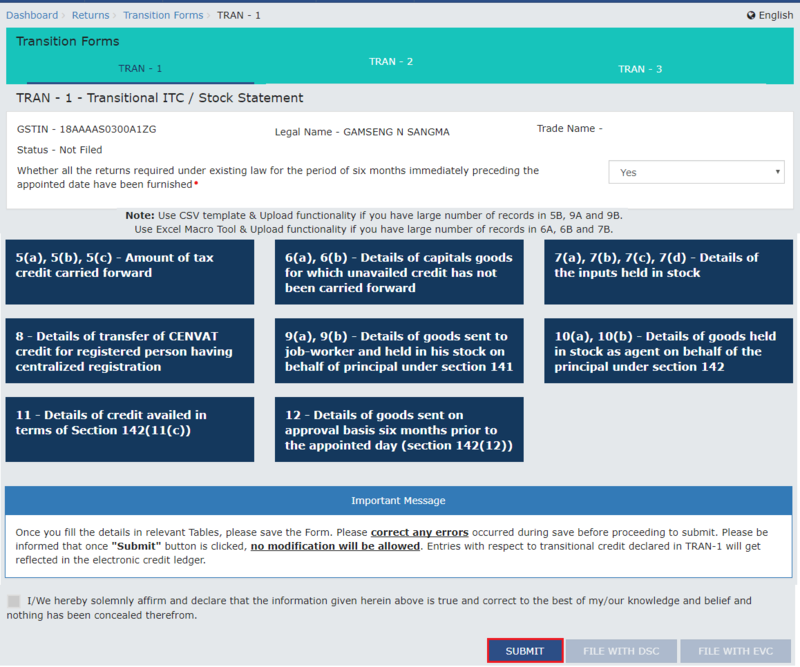 Once, TRAN-1 gets successfully submitted, the transition credit claimed is added to the balance of Electronic Credit Ledger. But, the same can only be utilized after one finishes with filing TRAN-1. After clicking on “PROCEED”, select the certificate and then click on “SIGN”. In this case, enter the OTP sent on your email and the registered mobile number of the authorized signatory. Next, click on “Verify”. A success message will now be displayed on the screen and acknowledgment will be generated. Now, click on “OK”. The status of TRAN will now be changed from “Submitted” to “Filed”. The credit claimed in TRAN will get credited to the credit ledger of the taxpayer once the form has been filed successfully. The ITC in Electronic Credit Ledger can be used to offset the liability of GSTR-3B (July 2017) or any other subsequent return. When do I need to file the transition Form GST TRAN – 1? Transition Form GST TRAN – 1 has to be filed within 90 days from the appointed day (1st July 2017). Also, the time limit can be extended by another 90 days by the commissioner if recommended by the GST Council. 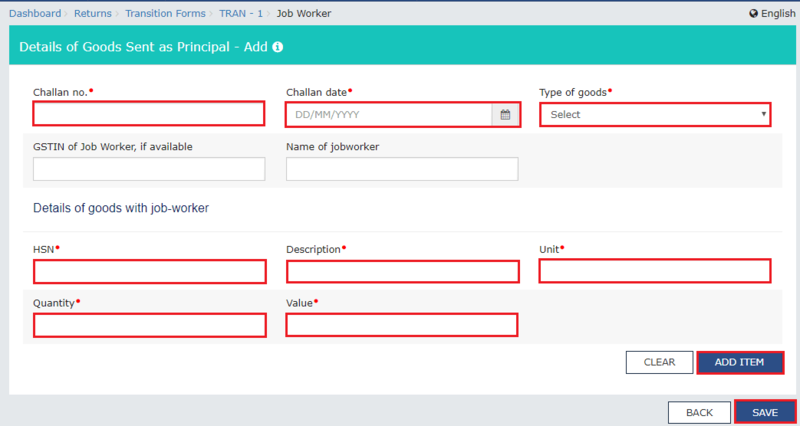 Do I need to attach any document along with transition Form GST TRAN – 1? There is no need to upload any document as an attachment along with TRAN – 1. In case details are beyond a limit the same will be uploaded through an Offline Utility tool on the portal. 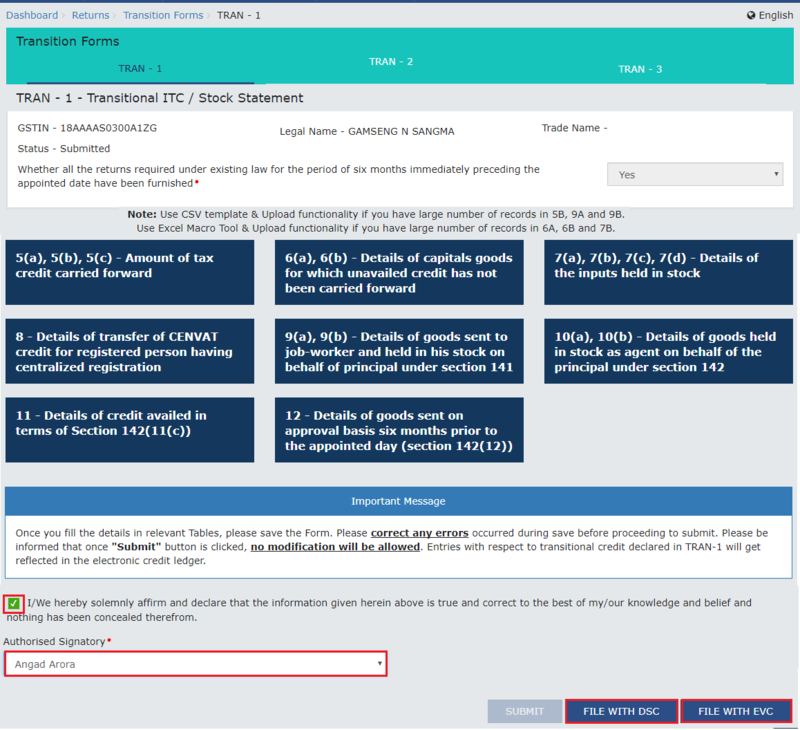 Can I make any amendment to the transition Form GST TRAN – 1? The details furnished in transition ‘Form GST TRAN – 1 cannot be amended. However, different tables of transition form can be furnished till the last date. I am registered as composition taxpayer. Do I need to submit the TRAN-1? No. Transition Form is not to be submitted by the taxpayer registered as composition dealer.